Proper wheel alignment is essential to the overall health of several of your car’s systems, including tires, suspension, and handling. At Doug’s Service Center, our ASE-Certified auto mechanics know that and also know that the potholes around Topeka can wreak havoc with your wheel alignment, causing expensive auto repair if left unchecked. We are so passionate about the well-being of you and your vehicle’s wheel alignment that we go out once a month on our own time to repair potholes around the Topeka area. Now that’s the dedication to excellent auto repair. 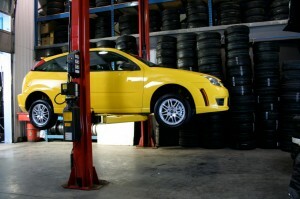 When your wheel alignment is out of whack, the situation can cause uneven and accelerated tire wear. Additional stress is placed on the car’s suspension components, resulting in an uncomfortable ride and potentially dangerous, impaired handling characteristics. Doug’s Service Center has a state-of-the-art Hunter wheel alignment machine that ensures our customer’s front-end auto repairs are done to the highest standards in Topeka -- or anywhere. “I have an F150 that I don't drive often. I found out I had a brake leak right before I needed my truck for the weekend. Doug squeezed me in last minute on a Friday afternoon and saved me and a few other people headaches for the weekend.” -- Paul A. When it comes to wheel alignment or another auto repair, turn to the top pro auto mechanics at Doug’s Service Center in Topeka. For the finest car care anywhere, schedule an appointment today, or stop by at 601 Southwest Fairlawn Road, Topeka, KS 66606.